There really wasn’t anything about Willie Taggart that I was going to miss when he decided to head back to Florida. His game planning was pedestrian, his in-game coaching was sub-par, his media persona was “car salesman-esque,” and his running of Justin Herbert up the gut as if he were Jerome Bettis was utterly mind-boggling. These things ultimately cost the Ducks a very successful 2017 season, not to mention destroying the 10-win prediction I put out last summer. But don’t worry, I’m not bitter. That would be far, far beneath me (I’m so lying). So, while lots of fans were upset about the way he left, I wasn’t. If he wanted to hike it back to the Seminole State, great. Just don’t leave any bread crumbs along your path back home. 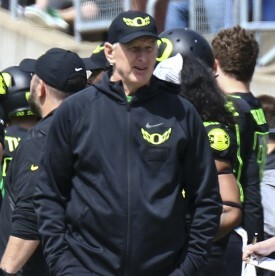 Coach Leavitt is on track to create a “shutdown” defense at Oregon. He was gone, and yet for all the things he did poorly, as I talked about last December, he did leave the program in better shape than when he got it. Willie could recruit, and he blew away the long-held belief that you couldn’t recruit high-level talent in large volume to Eugene, particularly along the trenches. So, when Willie left, that was my only concern: Could the Ducks continue the high-level of recruiting that Taggart had started in Eugene? 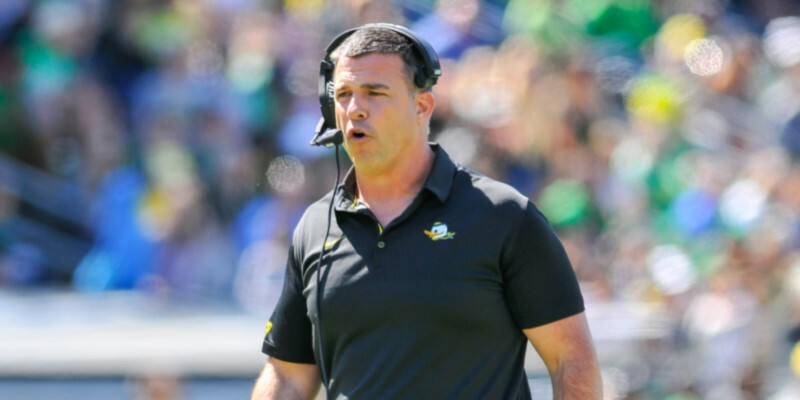 Mario Cristobal was an elite recruiter at Alabama, finishing No. 1 in the national 247Sports composite rankings each of his four seasons. He was named the National Recruiter of the Year by 247Sports during the 2015 cycle, and in 2016, he was ranked as the nation’s No. 2 recruiter in the country by 247Sports. Now, all of this is well and good, but how hard is it to recruit to Alabama? I mean, give me an office in the Alabama football complex, an assistant coach’s title, and a big fat per-diem, and I’m sure I could haul in a couple 5-star recruits in my sleep. I mean, heck, it’s Alabama after all. Recruiting to Tuscaloosa has got to be like shooting catfish in a barrel. Right? So, the question was, would Cristobal’s Alabama success translate to success at a school tucked away in the Pacific Northwest? The early returns are telling us, YES. 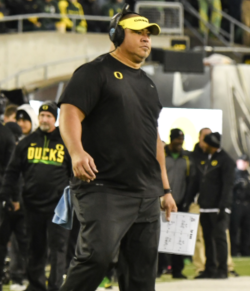 Coach Salave’a is helping to bring top DL recruits to Eugene. I recently bought a vehicle from a local dealership where my good friend Dan sells cars. I’ve known Dan for many years and I’ve known him to be a very honest person, so I trusted him with my purchase. But Dan definitely had his “car salesman” gear, which was beginning to drive me nuts. I found myself again muttering, “slick-cheese,” under my breath. It was the exact same feeling I got when Slick Willie did his dance with Florida State last November. The last thing he needed was to blow the sale because he was reminding me of one “Slick” Willie Taggart. And “blowing the sale” is something that I think Taggart would have eventually done at Oregon, as the Oregon faithful may have grown tired of his act. Another reason I wasn’t sad to see him go. For less than two weeks, consensus four-star cornerback Jeremiah Criddell was the highest-rated defensive back pledge in the history of the Oregon Ducks football program. That’s because last Thursday, Oregon once again landed its highest-rated defensive back commit in program history, as MyKael Wright chose the Ducks over offers from Alabama, Michigan, Texas, UCLA, USC and others. Wright is the 10th commitment in Oregon’s 2019 recruiting class and the third top-50 talent nationally to pick the Ducks, joining Criddell (No. 46) and linebacker Mase Funa (No. 38). The Ducks currently have an early top 10 class nationally. 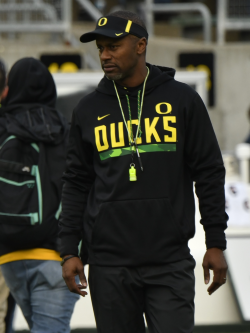 Willie Taggart did instill some recruiting chops during his stint in Eugene. What’s really nice to see for a change is the defensive talent that Oregon is bringing in. If this continues, the ”bend but don’t break” defensive strategy—which was always a cute way of saying “average and far from elite”—that the Ducks have employed may well morph into a complete ”shutdown” defense. 3* CB Marques Caldwell (Alivin, TX): A Taggart recruit sticking with Ducks. 4* CB Jeremiah Criddell (Santa Ana, CA): The nation’s No. 6 cornerback by 247Sports. 4* APB Sean Dollars (Santa Ana, California): The consensus No. 1 player in the country at his position. 4* LB Mase Funa (Santa Ana, CA): Falls just short of five-star status as the nation’s No. 3 outside linebacker. 4* TE Patrick Herbert (Eugene, OR): One of the top 10-15 tight ends in the country. 3* QB Cale Millen (Snoqualmie, WA): Son of ex-husky Hugh Millen. 3/4* ATH Cameron Williams (Bakersfield, CA): Probably play safety. 3/4* ATH Jayvaun Wilson (Valencia, CA): A running back who could play outside LB. 4* CB MyKael Wright (Valencia, California) The nation’s No. 4 cornerback.